Your workplace is like your temple. It is the place where you unload your skills, your creativity and your outputs and receive pride, happiness and a wage in return. However, the unfortunate fact is that not many people can enjoy the facilities of having a great workplace. So what makes a good workplace? A great workplace refers to a positive environment where you go to work every day. It is a place where you feel respected where your contributions are appreciated and where you enjoy friendly interpersonal relations with your colleagues as well as with your employers. If you want to make your workplace great then the base line of it should be trust. Trust among your employees drives great engagement among them , thus improving business performance . Great workplaces are developed not by the projects taken or creating to do list , but its built by the relationship that employees share among themselves. Enjoy while working with your co workers. Working together as a team making it a better and trustworthy workplace. Great workplace usually possess few attributes that make them differ from regular type of workplace. These kind of work environments works really well and moreover employees love working in such workplaces. A safe space where you can contribute your ideas and thoughts without feeling threatened or anxious. Where you can enjoy great interpersonal relationships with your employers, your co-workers and the staff working in the office. Where you are appreciated for your contributions towards the company. Where you feel safe and protected to work. Where you feel immense pride in working. Where you are adequately compensated for your contributions. Where you are recognized for your good work and given due credit, you deserve. Where you have trust and faith in the people who you are working for. Where you feel respected by the staff, your peers and your bosses. Combining these above factors, you can create a great working environment for yourself as well as for your staff. One of the greatest characteristics of a workplace is one where you can enjoy transparent and open communication. Do you feel like your words are validated at your workplace? Do you get a fair chance to share your thoughts, ideas and opinions without the fear of being reprimanded? Can you go up to those in higher authority and discuss an issue which has bothered you? 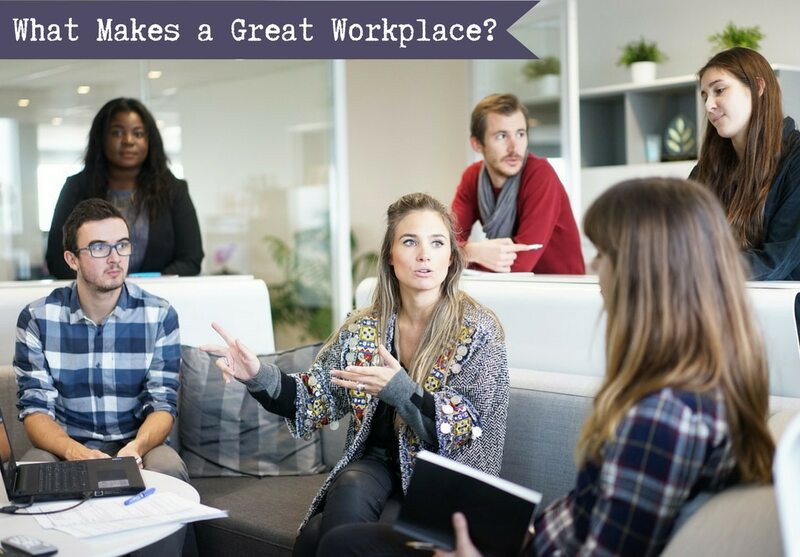 If YES, then congratulations, you are working at a great workplace! A great workplace is not just measured by how much you contribute at your workplace. It is also important for you to keep a work-life balance. This means that you ideally should not be taking your work back home and working on the weekends. Know when to say ‘NO’. An ideal work-life balance signifies that the office is a great workplace that knows how to take care of their employees’ needs without overburdening them. One of the main characteristics of a great workplace is one that imbibes in all their employees a sense of teamwork. You should feel comfortable to work in a team with your co-workers. There should be no feelings of negativity; rather, everyone should work in unison towards a specific goal. However, a great workplace is also one which allows you to showcase your individuality. Maybe you have a unique idea to contribute towards this team project. If you are working at a great workplace, you will feel comfortable to share this idea with your other team mates. Does your workplace have great team spirit amongst the employees? Does everyone feel happy and positive working with each other in team projects? These are some of the signs of a great workplace. Everyone at the office is actively working towards the same goal. You all may have different ambitions, but in order to reach those ambitions, you need to work together as a team to achieve set targets. A great workplace cannot be simply characterised by the outputs and profits made by the company. It is also an environment which you look forward to visiting every day. Being on good terms with your co-workers is one thing, but developing workplace friendships is much more special. You should also know how to have fun at your workplace. If your workplace seems like an ‘all work, no play’ situation, then you should be worried. A great workplace is one that is made up of great people. If your workplace consists of all the top workers, hardworking individuals with creative minds and dynamic personalities, you are definitely working at a great workplace. A good company will hire and retain such people who can outshine in every aspect of their work and their life. A great workplace will actively invest in its employees training and development. The company wants you to continuously upgrade your knowledge and skills to perform to your optimal level at the office. In order to do so, your company creates the time, effort and opportunity for you to grow and develop your skills. An environment in which you are always learning new things and upgrading your knowledge can be considered a great workplace. Your company should be investing not only in upgrading your skills and knowledge, but also in taking care of their individual employees. They do this by investing in your health and wellness by offering you wellness options. These options make you to inculcate a healthy lifestyle and a great chance to be fit, healthy and positive. A great workplace is one that is led by great leaderships. If your managers and bosses have great leadership qualities, respect all their employees. Genuinely take an interest in their welfare and performance. A good relationship between employees and their leaders consist of mutual respect, open communication, honesty and support. A great workplace can also be characterised by how much they give back to the community. The workplace should inculcate a habit of giving into their employees. They can do so by donating their resources to charity and serving the community by helping those in needs. While there are no magical hacks that can help you create an environment of a great workplace, there are several things you can do on your own to create a good environment. Some of these tips and tricks can be started immediately and you will see the difference at your workplace. Start inculcating the habit of being transparent and open in all your activities at your workplace. Even if this means voicing out your displeasure at something said or done by a colleague. It is always a good quality to be open and transparent about your actions and opinions rather than talking about them behind someone’s back. This can create a vitiating atmosphere at the workplace. Show your commitment towards your workplace, and you will reap the benefits. Give it your 100%, be it in a project, in a meeting or at being a good employee or boss. Take responsibility for your own actions and words. You will be able to create the atmosphere of a great workplace by doing so. Laughter is the best medicine! You do not need to maintain a serious stance at work at all times. Show off your amazing sense of humour and crack a few jokes when the time and situation permits you to do so. Laughing is a natural stress buster and releases endorphins in your body, allowing you to continue working with a positive outlook. In order to create a great workplace environment, learn to be flexible and adapt to people and situations. As we all know, change is the only constant. Being stubborn or stuck up in old ideas will never allow you to move forward, and more often, will create a bad working atmosphere and peer to peer relationship. Learn when to say ‘NO’. If you want to work at a great workplace, you need to start taking the steps on your own. Maintaining a good work-life balance is imperative in doing so. You need to learn how to arrive at work early and leave work on time. Learn when you need to just stop, call it a day and go home and spend time with your family. A good personal life is equal to a fresh mind and a good work life. It is important for you to interact with everyone at you workplace, while maintaining a certain level of professionalism. Your job is not simply to get to work, complete your tasks and leave. Build up good interpersonal relationships with your peers and other staff members. This gives way to creating a happy and peaceful working environment. A great workplace is one where your employees are always engaged in some kind of activity. If work is not piling up, create some time and space for everyone to relax and just take some time off work. Engage in fun and interesting activities. You can also have workshops at the office so that the staff can learn or develop a new and interesting skill. This will keep everyone at the office always engaged, active and happy. One of the biggest secrets to a great workplace is to promote meritocracy. Compensation and reward on the basis of hierarchy promotes a negative environment at the workplace, where other hardworking employees feel unfair at not being given the appropriate reward for their effort. Instead, let everyone know that they will be fairly rewarded for their hard work, and the company will grow in leaps and bounds while maintaining a healthy workplace environment. What seems like the most obvious way to inculcate positivity into the workplace? It is by filling the workplace with happy, positive and optimistic people. Keep politics as far away as possible, and maintain distance with those who like to dwell in such an environment. Instead, learn to live a healthy life and be positive, so that you can spread this positivity at your workplace. It is plausible that someone has done something at the workplace which you do not appreciate. However, it is important that you remember not to be harsh. Even if you must disagree with someone else, do so without disrespecting or putting them down. One of the biggest secrets to creating a great workplace is to get out of the routine every once in a while and learn to live outside of the workplace. Make a plan, to go out somewhere with all your office staff for a weekend; maybe to a football game, or to the amusement park, or just out for an evening of drinks. This outing can prove to be very healthy as it will strengthen the bond between co-workers at the workplace as well as give everyone a chance to get to know each other and have fun in a different kind of an environment. This exercise can also help in building a strong bond and a sense of team spirit amongst employees. Having a great workplace to look forward to every morning can be one of the best things in your life. You will be able to give in your best, develop amazing relationships and watch your career skyrocket. Creating a great workplace starts from within, so follow some of these simple secrets to creating a great workplace and look forward to Monday’s for the rest of your life! Previous articleHiring Solutions – How to Recruit Employees Effectively? Next articleHow to Get an Internship at Cisco Easily? What To Do At Work When There Is No Work?